Residence Wellness Alert - TelASK Technologies Inc. - Improving patient outcomes while reducing healthcare costs. 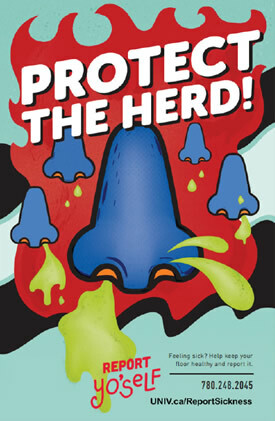 In student residence halls germs and diseases can spread quickly. The challenge is to catch potential outbreaks before they gain momentum. TelASK Wellness Alert is a symptom tracking and disease outbreak notification system that helps University Health Services and Residence Services quickly identify and get ahead of potential outbreaks in residence halls. In student residence halls germs and diseases can spread quickly. Every day students share bathrooms, kitchens, lounge and study spaces. One or two undetected cases of noro-virus or influenza can infect an entire floor or building in a very short period of time. The challenge is to catch potential outbreaks before they gain momentum. Residence Wellness Alert is a symptom tracking and disease outbreak notification system that helps University Health Services and Residence Services quickly identify and get ahead of potential outbreaks in residence halls. A comprehensive promotional campaign in the residence halls encourages students to self-report any symptoms they are experiencing in order to help keep themselves and their fellow students healthy. Students can access the reporting tool by texting a number on their smart phone, logging in through the university website or mobile app, or by calling into an interactive phone system. They provide their student ID, residence hall and room number and are guided through an easy to follow symptom screen that takes just a few minutes. 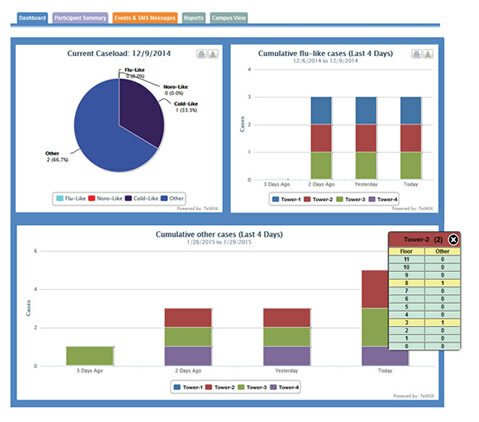 Existing algorithms screen for norovirus, influenza and common cold-like symptoms. However questions can be quickly and easily modified to include other diseases. 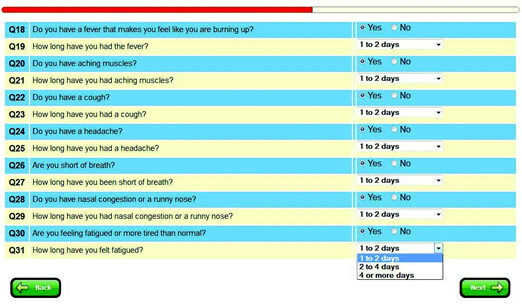 Students who report receive follow-up emails for up to eight days to check whether their symptoms have changed. When Wellness Alert detects a rapid escalation in the number of students reporting or a cluster of symptoms in a particular residence, automatic alerts are sent to designated personnel advising them of the nature and location of the potential outbreak. Authorized staff can login to the Wellness Alert dashboard 24×7 to see what symptoms are being reported and where trends or hotspots are developing. At a glance staff can see the increase in the numbers of cases reported by illness type over the past four days on a building by building and floor by floor basis.